In the mid 1980s, Premier cruise line partnered with Walt Disney World, providing families with seven-night land and sea vacations. After spending several days in the parks, guests boarded the Big Red Boat for a short Bahamas cruise that featured costumed Disney characters. It was a successful venture for both parties until the relationship ended in 1993. 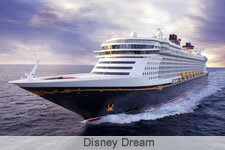 In 1995 Disney Cruise Line was created. 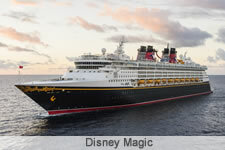 The cruise line began with two ships, the Disney Magic (1998) and the Disney Wonder (1999). They are gorgeous vessels designed to evoke the grand ocean liners of the 1920's and 30's but with all the bells and whistles of a modern ship. The twin ships elongated navy blue hulls, matching red funnels (one is just for show) and intricate yellow insignias are striking. 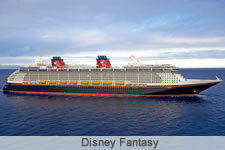 Ten years later, two larger ships joined the fleet: the Disney Dream (2011) and the Disney Fantasy (2012). Nobody understands a family's needs as well as Disney! Their standard cabins are the largest in the industry. The majority of staterooms come with a bath and a half — one with just a toilet and sink, the other with a bathtub and sink. There's also a little fridge, and lots of storage space. Cribs, playpens, strollers, bottle sterilizers and Diaper Genies are available upon request. Disney Cruise Line created an innovative rotational dining system, meaning that each night, you will rotate to eat in one of the three main dining rooms and your servers and table mates will rotate with you. Each restaurant offers a different atmosphere (and special surprises). For a more sophisticated dining experience the adult-only restaurants, (Palo and/or Remy) should not be missed. The Walt Disney Theatre is home to the most magical productions to ever grace the sea! 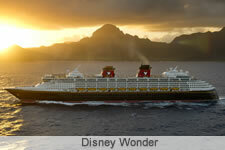 On some voyages you may be treated to a premier of a new blockbuster Disney movie, or a variety show. Character meet & greets, movies on deck, pool parties, 3-D movies, and an action-packed sports deck are just a few of the available entertainment options. Parents will have as much fun onboard as their kids will! Castaway Cay is Disney's private island in the Bahamas and is always a highlight of a Disney Caribbean cruise. It may be the most beautiful of any cruise line's private islands! Pristine white sand beaches, turquoise water, sherbet-colored umbrellas, swaying palm trees and of course, Disney characters, await guests on the island. Guests can look forward to enchanting cruise experiences around the world aboard Disney Cruise Line! From popular spots like the Bahamas or Caribbean, to more remote locales like Alaska, Italy, Spain and Greece, a Disney cruise is a truly magical experience!